I have many talents in the kitchen (after years of trying and failing and trying and failing!) but the one area I still have miles to go on is the grill. I have no great reason or excuse for my lack of grill expertise except that I live with a great grill master so why would I want to get in the way of greatness? Since Labor Day and the unofficial end to summer is heading our way fast, I thought I would share Jim’s take on dry rub ribs. This recipe packs some serious spice and flavor into a small rib package. Jim uses the low and slow method of cooking with coals and woodsmoke to give it that extra bit of flavor that will make you devour them before you even realize what you did! So this long weekend, why not grab some ribs, make up a mix, get a cooler full of cold ones and get some of your favorite people to come by and help toast the end to another great summer! 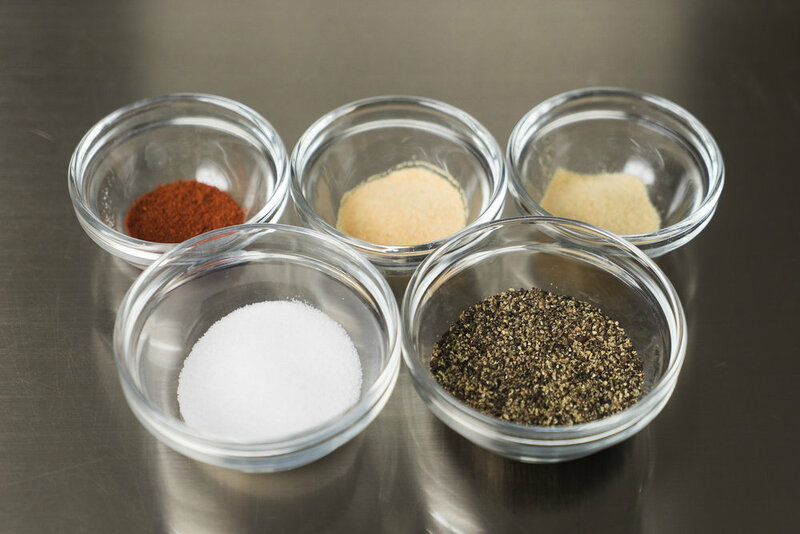 Mix the salt, pepper, paprika, garlic powder, and onion powder in a small bowl and gently toss to combine and set aside. Remove ribs from packaging and lightly rinse in the sink to remove excess blood. Place on a cutting board and trim any excessive amounts of fat or bits hanging off the edges. If the ribs still have the membrane on them, flip them meat side down and make a light slice down the center, the length of the ribs. 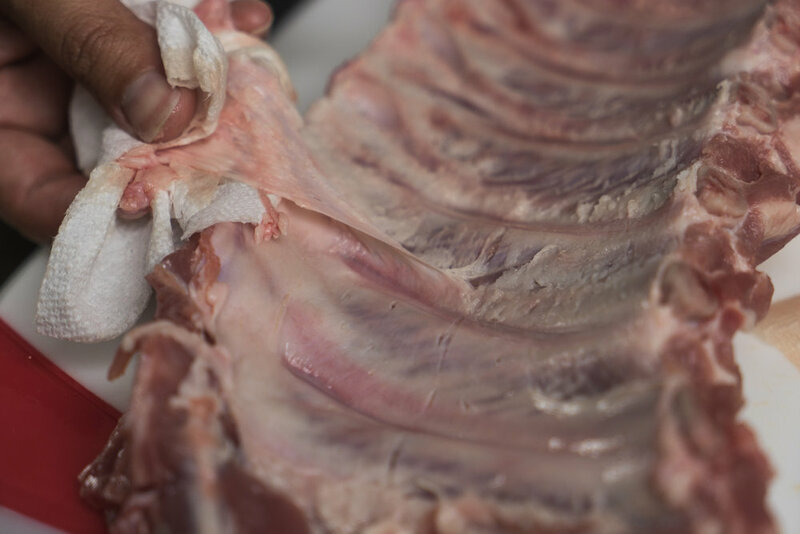 Using a paper towel, gently pull the membrane to remove it from the ribs. Go slowly to ensure you only remove the membrane and not the meat. Drizzle olive oil and being sure to work the oil into all parts of the ribs. 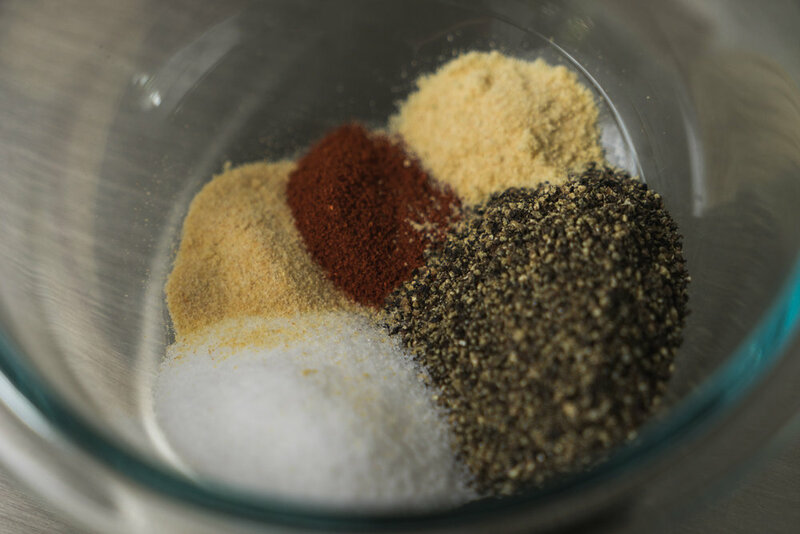 Gently shake the spice mix above the ribs, focusing on the meat side and the edges. Concentrate on getting an even coat over the entire surface of the ribs. Set rib on work surface meat side up and let rest while you start the fire. Fill a charcoal chimney with briquettes or lump charcoal, light and let them start to ash. Pile the coals to one side of the grill, close the lid and allow grill to reach about 300 degrees (you can measure with a thermometer placed on the grill surface away from the fire). Once grill has come up to temperature, add some hardwood to the fire (cherry, apple, and maple provide a great sweet smoke) and set the ribs meat side up on the grill opposite the fire. You may have to add coals and monitor the air gates, but resist opening the grill to peak. After 3 hours, spray the ribs generously with the apple cider vinegar on all sides and then wrap them completely in aluminum foil. Return to grill, meat side down cook for another 2 hours. 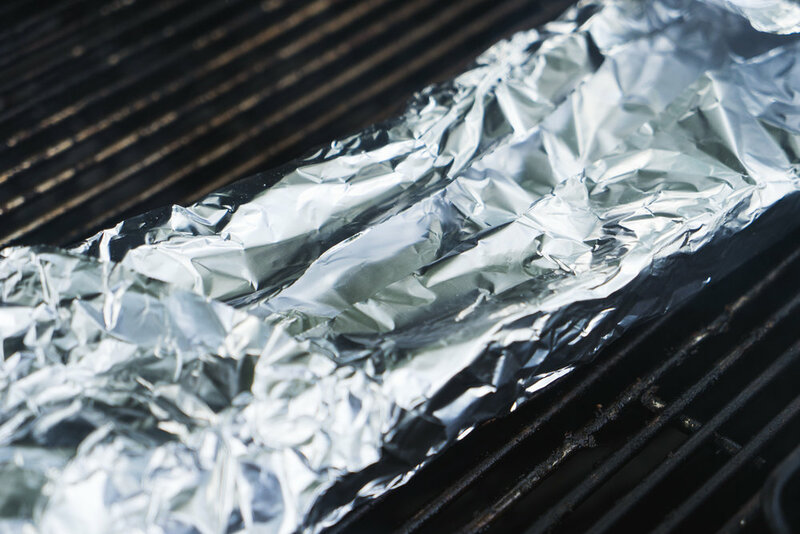 Remove ribs from grill and rest on a large cookie sheet still wrapped in foil to rest for 30 mins. Transfer the ribs to cutting board or work surface, very carefully (as they will be hot!) remove them from the foil, and let them rest for 15 mins. Slice the ribs about every two ribs or so, ensuring you slice between the bones and through the meat. Add some tasty sides and prepare to enter rib nirvana! While you and your guests are waiting for those ribs, why not whip up a batch of Tomato Mozzarella Basil Bread using the still abundant tomato supply and the fresher than fresh basil while they wait to feast? And if you need a nice, cool side to compliment the ribs, give our Quick and Tasty Cucumber Salad a go! Now get out there and give summer the send off it rightly deserves!